In May, 120,000 people in northwestern Colombia were endangered by the potential collapse of a hydroelectric dam being developed by Empresas Públicas de Medellín (EPM), a client of Canada’s export credit agency. EPM, which is under investigation for possible corruption linked to the project, has now been ordered to halt construction of the dam. The near collapse of the Ituango dam has again exposed gaps in Export Development Canada’s screening process for clients. Photo credit: Svenswikipedia. The crisis began after a blockage in a diversion tunnel at the Ituango dam site sparked heavy flooding, displacing hundreds in the province of Antioquia, north of Medellín. A spate of torrential downpours and landslides followed, causing the water levels of the Cauca River to rise and prompting the Colombian government to declare a state of emergency as the risk of the dam rupturing loomed large. The crisis forced the evacuation of at least 25,000 people. While many evacuees have since returned home, as of July 1 some nearby communities remained under high alert due to the risk of landslides. According to Colombian media reports, in June United Nations experts warned of weaknesses in the dam’s design. The experts also raised concerns about EPM’s failure to adequately communicate to the affected public about the risks posed by the crisis. The Ituango dam project, set to become one of the largest in Latin America, is being jointly developed by EPM and the government of Antioquia. EPM, a Colombian state-owned enterprise, has twice benefitted from the support of Export Development Canada (EDC) in recent years. In 2016 and 2017, EDC provided EPM with financing totalling between 500 million and one billion dollars. Reports of serious human rights abuses have long plagued EPM’s project. The company is currently the subject of three investigations launched by Colombia’s attorney general to examine allegations of corruption and environmental damage linked to the development of the dam. According to locals, the company has deployed riot police to expel indigenous communities from the project area, and has contracted private security companies in addition to military and police units. An estimated 700 families have already been displaced. Activists report a wave of violence and intimidation, including cases of torture, targeting people who’ve spoken out against the project, such as members of the Ríos Vivos coalition. In May, two members of the coalition were murdered amidst an increase in threats levelled against Ríos Vivos by paramilitary groups operating in the region. 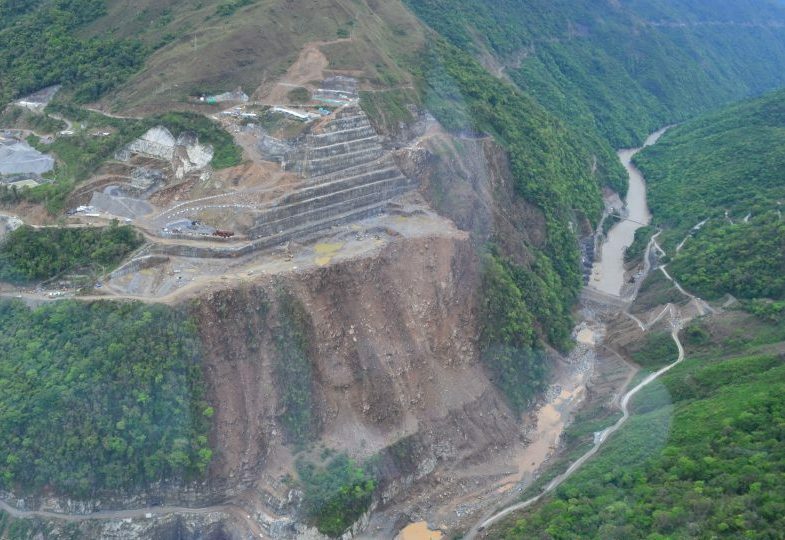 The Center for International Environmental Law (CIEL) attributes the recent crisis at the Ituango dam to weak environmental regulations and the absence of adequate impact assessments linked to the project’s approval. CIEL asserts that local communities lack access to relevant information and were not meaningfully consulted. Communities affected by the Ituango dam have filed a complaint with the accountability mechanism of the Inter-American Development Bank (IDB), claiming that the IDB violated its social and environmental standards when investing in the project. Like the IDB, Export Development Canada has policies requiring that it take social and environmental impacts into account when deciding whether or not to support a company. Above Ground has long questioned the adequacy of EDC’s policies in this regard. The Ituango dam crisis presents a further example of a company that EDC opted to support despite longstanding allegations of wrongdoing. In June the trade minister indicated that EDC’s adherence to the “highest corporate social responsibility standards” will be assessed as part of Parliament’s upcoming review of the Export Development Act. This review provides a vital opportunity for Canada to address the accountability gap. Legislators must work to dramatically strengthen EDC’s screening for human rights and environmental risks, and ensure a robust, transparent process for holding the agency to account for its decisions.